The ANSiscope® Basic is a safe, non-invasive monitoring device designed for the Autonomic Nervous System (ANS). The ANSiscope® device provides the fundamental Heart Rate Variability functions, such as Autonomic Dysfunction, ANS Monitoring and the 30:15 ratio test. Other features of the product help medical professionals better understand symptoms that affect the ANS; such as chronic pain, the onset and tracking of diabetes, and all disorders that affect the ANS. The ANSiscope® device operates in real-time, and is ideal for use in any professional medical environment...from a physician's private practice to a hospital operating room. The ANSiscope® device also helps physicians act quicker to improve the health of their patients. The new handheld ANSiscope® device has a large screen display. Addtionally, all functions performed by the ANSiscope® device can be viewed on the large screen monitor. The results obtained from measurement applications are recorded in an Electronic Patient Record creating an electronic equivalent of the patient paper folder. All measurements are automatically recorded in the patient folder for later transmission to a computer for storage and printout. The ANSiscope Basic comes preloaded with the ability to make 50 ANS measurements. Two types of measurement pacs are available - a 50 pac and a 100 pac. Upon purchasing one of these measurement pacs the measurement counter in the ANSiscope will get updated automatically. Process the raw ECG/RR interval data obtained using different analysis techniques. Process the existing data to update the results (using the ANSiscope® technology), and update the existing research and published papers. Users of the ANSiscope® device are provided with immediate access to customer support worldwide through the ANS Competency Center. 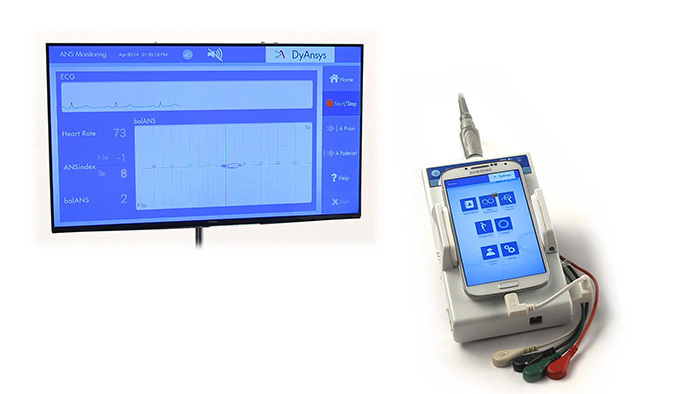 Simple pressing of the designated icon positioned on the ANSiscope® device connects users to the DyAnsys ANS Center for assistance. Additionally, medical providers have the ability to participate and interact with colleagues all over the world via the ANS Forum application. The delivered product does not include the large display as shown in the photo, but it is available for purchase separately. The product delivered does not include the large display as shown in the photo, but it is available for purchase separately. NOTE: The real-time ECG signals are visualable on the ANSiscope® and big screen display. Diabetic Autonomic Neuropathy (DAN/CAN) grouping: groups H, E, L1, L2, A and MA. Frequency-domain indices such as ULF, VLF, LF, HF powers. All the data stored in the Patient Record is exported to AirStash Wireless USB, and the patient data can be securely moved to a computer or laptop. All the exported data from the Patient Record are in the form of a PDF which is printing compatible. Data printing can be performed after AirStash file transfer to PC or laptop.